Click on the thumbnail images to get the full-sized image. These postcards all have the location printed on the postcard.
" 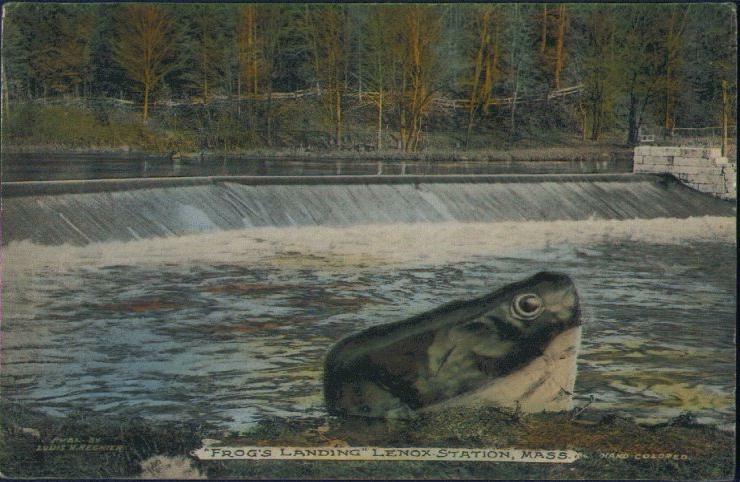 'Frog's Landing' Lenox Station, Mass." sent from Massachusettes September 25, 1908. 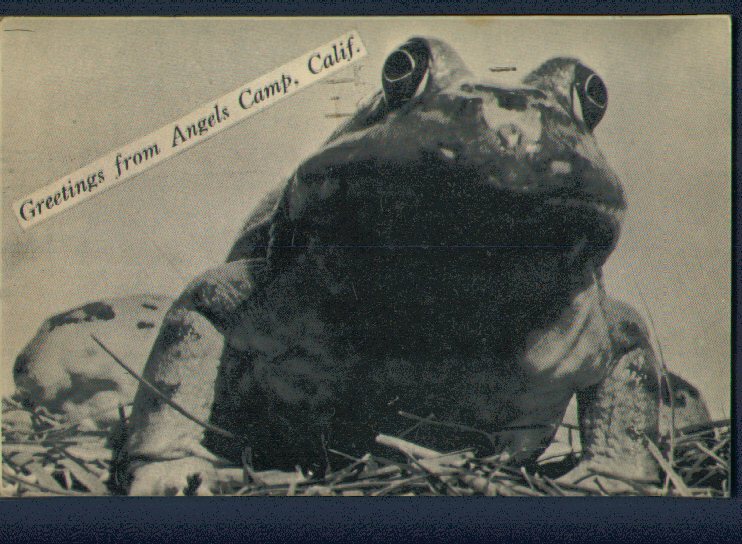 I received the following message about this postcard: "Some information about the " Frogs Landing at Lenox Station" Postcard. The 25 ton painted stone frog was painted by my grandfather, Peter J. Tyer in 1898. The huge stone on the west edge of the Housatonic River was a short way from his His house.It looked like an enormous sitting frog gazing south down the narrow river. On the west side of the river was the road from Lenox to Lenoxdale Ma. and the train tracks into Lenox Ma. He and his friend painted the top half of the stone a bright green, the bottom half bright yellow, put a large white eye encircled with black and outlined a mouth with black. My Grandfather took a picture of the rock and had 10,000 postcards printed up. He called the spot Frogs Landing and he became known as the "Sage of Frogs Landing". In 1976 , Author R.W.Smith , in his book "Town Talk" included a chapter about my Grandfather, entitled "Sage Dressing" . This postcard has been collected by several generations of my family. I was happy to see it on your site. Robert E. Tyer, Springfield, Ma" When I asked if the frog rock was still there, Robert replied: "Yes the Frog is still there, although it needs a fresh coat of paint, The old waterfall has been rebuilt and during that process the frog was put on a concrete pad to preserve it. The frog can be seen by a trained eye from the road to Lenoxdale." "The Green Frog Restaurant, Waycross, Georgia 'Chicken dinners - Frog legs - Sea foods - Western steaks - We Serve Everything from Sandwiches to Banquets' " not used. On the back it has "The Green Frog On U. S. Highway 1 Short Cut Waycross, Georgia. Air conditioned. - Good Food. Service with a Hop. Plenty Parking Space. AAA." 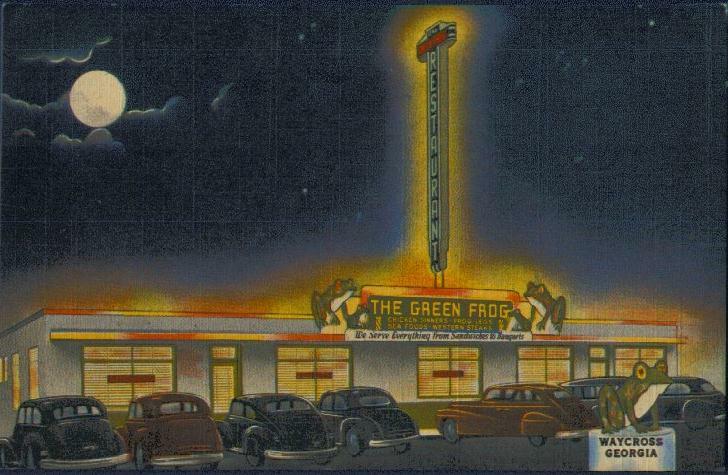 There is no date on this postcard; however, the cars in front of the restaurant will give you some idea of the date it was printed. "Greetings from Angels Camp, Calif." sent from California May 24, 1962. On the back it has "Angels Camp, Calif., home of the Annual Jumping Frog Jubilee; locale for Mark Twain's famous story, 'The Jumping Frog of Calaveras'." 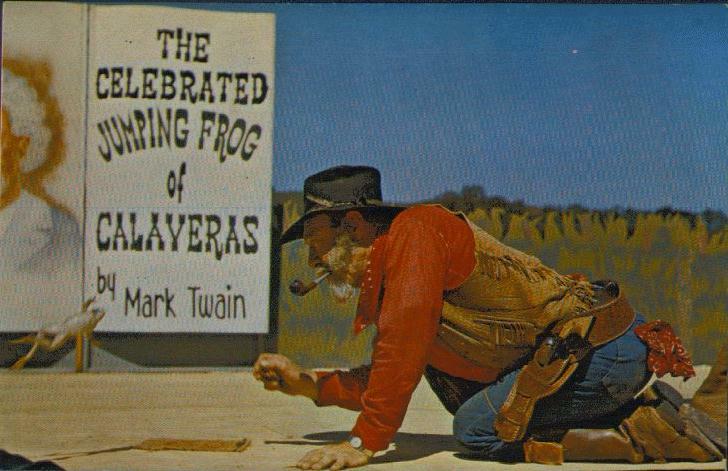 "The Celebrated Jumping Frog of Calaveras by Mark Twain" not used. On the back it has "Angels Camp, California The Jumping Frog Jubilee takes place each year the third weekend in May. Frogs and people from all over the world participate in this historic celebration which has its roots in Mark Twain's famous story, 'The Celebrated Jumping Frog of Calaveras County'." 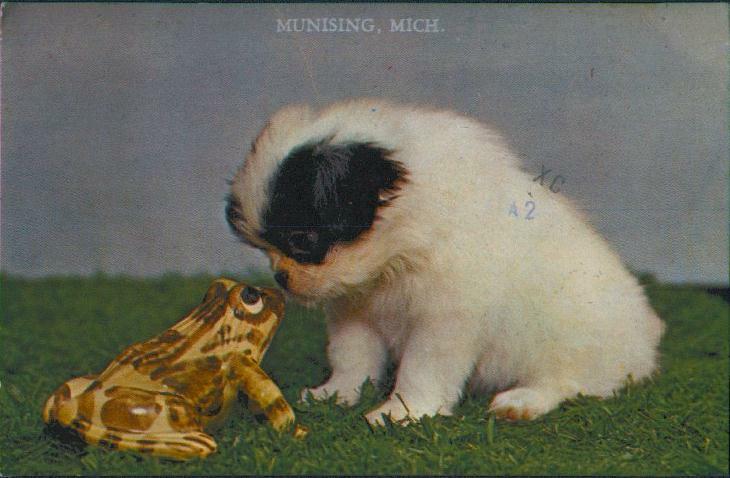 "Munising, Mich." sent from Michigan in 198something. Sent from Iowa August 7, 1981. 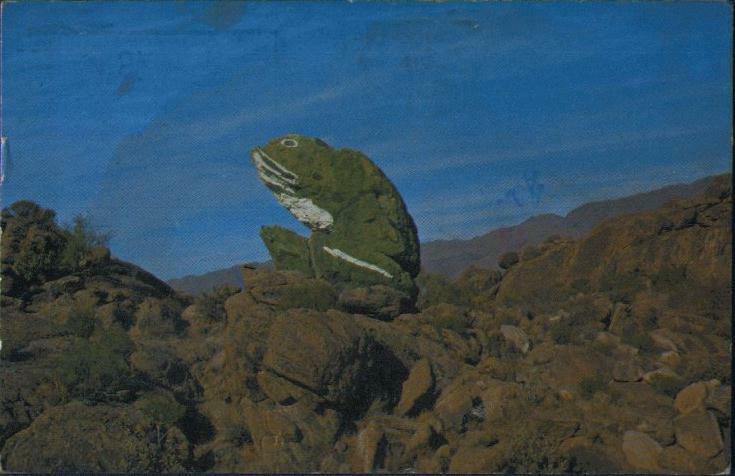 On the back it has " 'Rocky' the Desert Frog Natural rock formation, painted to further resemble a frog, located on the Wickenburg Highway 89 below the Yarnell hill." Page last updated 24 Feb 2007.